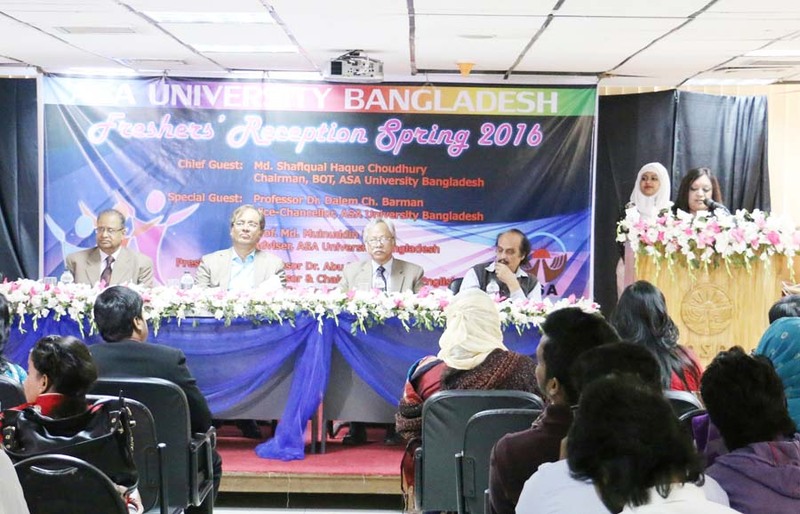 The Department of English, ASA University Bangladesh (ASAUB) organized a Freshers Reception for its newly enrolled students in Spring-2016 semester followed by a cultural program on 7th February, 2016. Mr. Md. Shafiqual Haque Choudhury, Chairman, Board of Trustees, ASAUB was present as the chief guest while Prof. Dr. Dalem Ch. Barman, Vice Chancellor of ASA University Bangladesh was special guest of the occasion. Prof. Dr. Abu Daud Hasan, Dean, Faculty of Arts & Social Science presided over the program. Mr. Md. Khalequzzaman Registrar of ASAUB spoke on the occasion, Diana Ansarey, Assistant Professor, Department of English gave the welcome speech in the program. Teachers and students from the Department of English staged a colorful cultural show in the second part of the program.